I love to shop yard sales and second hand shops for furniture, but without a car of my own, I don't get to go thrifting very often. To me, Craigslist.com is the next best thing. Or, maybe it really is the best option since you can window shop online at all hours! Since moving into our house almost 5 years ago and having a yard for the first time in over ten years, I really wanted a patio set. As with most big-ticket items, money was an issue. Sets that we could afford were not sturdy enough for our needs. Joe is a big guy. So are most of the men in our families. We needed something that we wouldn't have to replace the following summer. 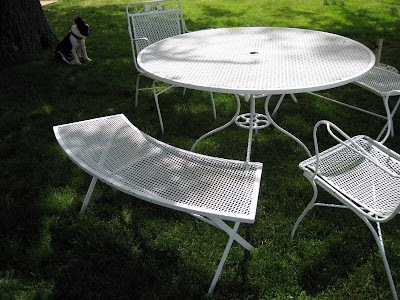 That first summer passed without us finding an affordable outdoor table and chairs set. 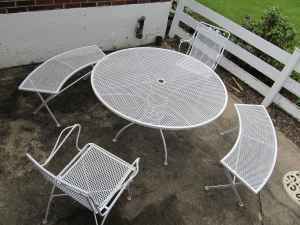 At the end of that summer (and each one after), I vowed that I would save up all winter long to get a sturdy set the next summer. Yeah, never happened. Other (more important) things came up. Every once in a while, I find the time to browse the furniture section on craigslist. Last Sunday, after Grace was in bed, I browsed the listings hoping to find a dresser for the big girl room that I want to get started on very soon. Joe was still awake, so I showed him the listing asking if he thought he'd be able to stop and look at it on his way home from work the next day. So, we set up an appointment to take a look at the set. Since the address was on Joe's way home from work, he went alone to check it out and decide if we would purchase or not. I love it! I'm so glad we waited until we found the perfect set for us and a price we could afford! Round table, 2 chairs, 2 benches and they even included a heavy umbrella stand. This is so much more my style than any of the patio furniture sold in retail stores right now. It's an older set (not sure how "vintage" it really is), it could use some cushions, an umbrella and maybe a new coat of paint in the next year (or maybe two). I'm thinking yellow! Very nice! Kudos for your patience and finding just the right set! Ah!!! What a great set! Love this set! The bench is my favorite part....that and the price! Love CL! Beautiful!! I LOVE it!!! Congratulations on scoring a fabulous find! Very neat! I would love to have a set like that. Great find! The benches are great. You can use them as a serving area too, so there is more room on the table to eat and converse but the food is close at hand. That was a great price, but did Joel haggle at all? When I send the guy out to do something like this for me I'll always ask him, were they flexible on the price? Great vintage find for $100. There are many possibilities with the color of spray paints out there today. You made a good choice in this patio set. It is different than most and will serve you well. Looks like you got a great deal!! Yellow would be fun! What a great set! And a great deal. And since the set is older, that means it was built to last. Very nice! thank you for joining TTF. I hope you have an awesome weekend! That's a great find! I like the idea of yellow as well. What a lovely addition to your outdoor garden decor. So nice. By the way, have you ever heard of freecycle. I have friends who started with Craigs List and then discovered Freecycle and loved it even more. :) Have a great day. Good things come to those who wait!!!! I love your patio set - the benches are just too cute! Thanks so much for sharing it at Treasure Hunt Thursday. That's a great set and in such great shape. Great job, fantastic deal! I love craigslist (when I'm not waiting for a buyer that never shows!). That's a great set and in such great shape. Very neat... it nice..
Love this set! The bench is my favorite part....that and the price!